Although I may not be Catholic, that does not mean I’m oblivious to the dietary changes of those around me come February. (This year, it’s Feb. 14). In that spirit, I thought it would be best to post a round-up of all the Lent-friendly recipes and columns. 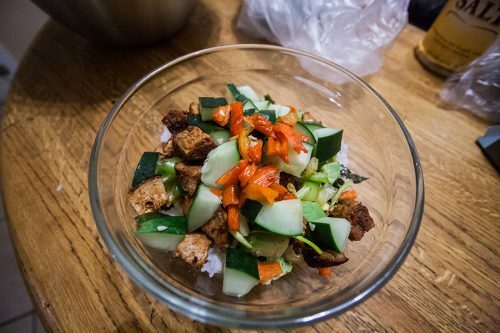 Rice bowls. 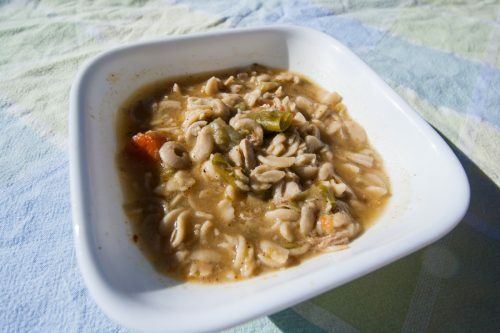 Substitute pork for fish or leave out meat entirely. 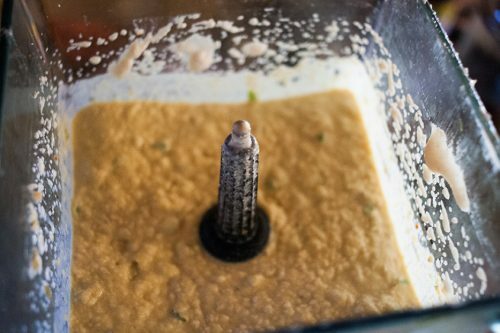 The finished green chili hummus, after everything has been blended. Thanksgiving is right around the corner which means, if you have to cook any part of the meal, you’re scrambling for ideas, for ingredients, for menu planning, for drinks, for the whole shebang. I’ve been there before and I’m going to be there again this year which means I’m scrambling as well. I know a few parts of the meal ‘m going to be making already. Obviously, there’s the turkey. That’s a given. Then there’s the gravy. (Here’s the full recipe.) That’s something where the majority can be made ahead of time. I personally make a sage sausage stuffing with sourdough bread and bake it in the oven. This makes it toasty and more delicious. There’re two options for the sage sausage. Either, make it yourself or just buy it. When it’s on sale, I buy it. When it’s not, I make it myself with fresh sage which I then dry in the oven. There you go. Two great options. I highly suggest you take my advice on the gravy. Either use the links above or see the recipes after the jump. It was Friday, which meant the Hispanic grocery on Wells, Marketon, was having its one day sale. I looked at the ad and lo and behold, Swai was on sale. However, I had no idea what Swai is so I looked the confusion fish up. The Iridescent shark (it’s not a shark) is actually a type of catfish (shark catfish, Wikipedia says.) It is, however, packaged as “swai.” Three names: iridescent shark, swai, and catfish. It’s a native to fresh water in southeast Asia. Speaking of, which, one of its relatives, the Wels Catfish, is reported to jump out and eat pigeons. If only we had them in our fountains. At $1.99/lb, I figured they must taste decent enough and if they’re anything like their North American cousins, the flesh should stand the test of the grill. So, I bought two packages, totaling 7.89 pounds. The fillets I bought were huge, the length of a small cookie sheet. I poured lemon juice on it, threw on some lemon pepper, pepper and garlic salt and let it sit for half an hour before throwing it on the grill. 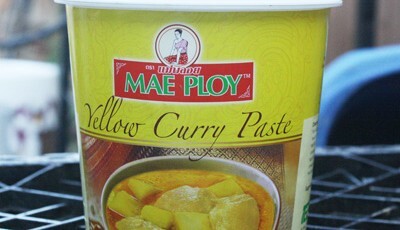 The plain recipe is: here. Ostensibly, this is a blog about more than just food. About life! 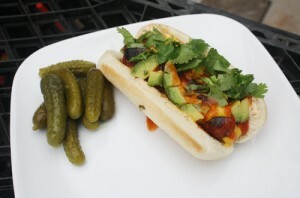 The food part of this post is about the taco dog: A hot dog with avocado, Tapatio and . . . Why not some cilantro? Honestly, I’ve yet to hear an argument against it. The other part is about my quest to read two books every three days, adjusted for length, or 200 pages a day. I was off to a good start: I was really into Stefan Zweig‘s “Beware of Pity.” A good injection of drama into my otherwise ho-hum life. (I find there to be a very strong argument for soap operas, myself being a former subscriber to “Sturm der Liebe.”) It was like Downtown Abbey, with more Hamlet awkwardness and soliloquies thrown in. I’m currently being slowed by the often prose-poem of “The Hamlet” by Faulkner. But more on that later. I had cilantro in the refrigerator. So I said, why not put some cilantro on it! Well, I exclaimed it. Didn’t really say it. Then, I realized I had those pickles. Those free pickles which therefore taste better. On to food, before I return to books! I bought a whole bunch of hot dogs, while they were on sale, for a party I was having. I’ve been slowly using the ones that remain to eke out a frugal existence. When I still had a can of sauerkraut, I used it. Now, I have a few extra avocados (five for a dollar) and the two can go together. Mix in some Tapatio hot sauce and some secret sauce (as used on fish tacos.) Some mustard and a dab of ketchup and there. A quick, frugal meal. I started out by warming up a bun and cooking up a hot dog, either on the grill or in the pan. 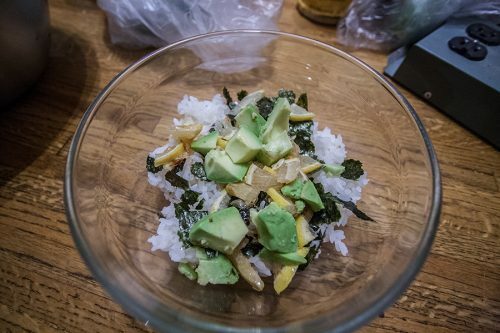 Then, I cut up half an avocado. Dog in the bun, mustard and secret sauce on top or in the bun, avocado on top, followed by the Tapatio. While you’re at it, look and see if you have any cilantro and if you find some, why not put some cilantro on it? It’s west meets west meets surprise cilantro! Since I’ve been unfortunately bereft of cash, I’ve moved much of my diet over to the produce that’s on sale for the week and brown rice. Brown jasmine rice, to be exact. The other part of my diet is using up whatever I have in the refrigerator. Recently it has been small dill pickles. Curry rice with a wee bit of cilantro on top. I then moved on to the stir-fry route with a failed General Tso’s chicken, made with broccoli. The sauce (made with apricot preserves) did not come out at all. (The point of the dish, to me, is the sauce, not the meat.) I considered it a failure. That left me with extra rice and no eggs. 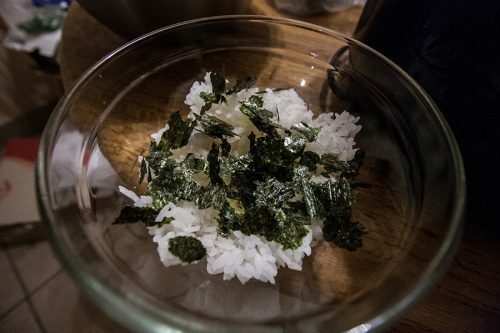 I didn’t want to just fry the rice — no eggs. 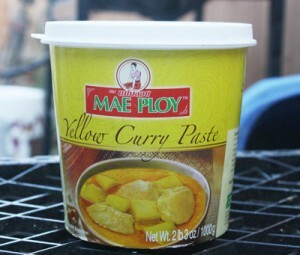 Instead, I dug through the quickly-emptying refrigerator for my big container of yellow curry paste. Two pounds, to be exact, of spicy goodness. I poured some oil into the cast-iron skillet, put the curry in, let it disintegrate some and then threw in the rice. Had I other vegetables, or had I remembered the just-bought sack of onions sitting with the potatoes, I would have thrown them in. Good contenders range from potatoes to eggplant to broccoli and sprouts, peppers and tomatoes and squash. 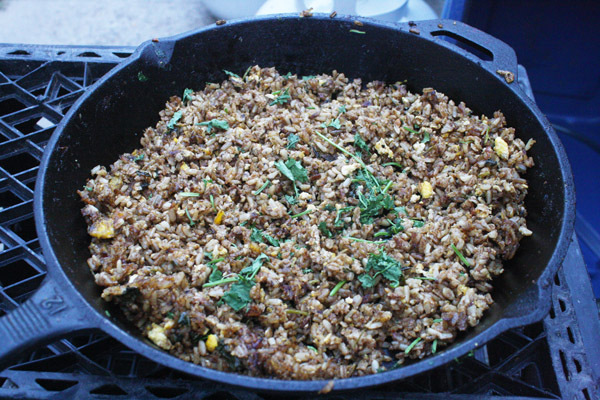 I then made a hole in the center of the rice, cracked for eggs, cooked and mixed them into the rice. I cut up cilantro I had bought for the purpose and threw it in, leaving a little extra to be used as a un-cooked garnish. It serves its purpose. Now only, if I had vegetables left. If you’re looking for a little extra somethin’-somethin’, then consider making some dill-heavy tzatziki to go with the curried rice.